What is Thinking Bakin' ? Thinking Bakin' is a free texture baking utility that uses the Cycles GPU rendering engine in Blender 3D to bake AO and Normal maps from high-poly models. It started out as a utility to make texture baking with Blender easier. But why stop there? 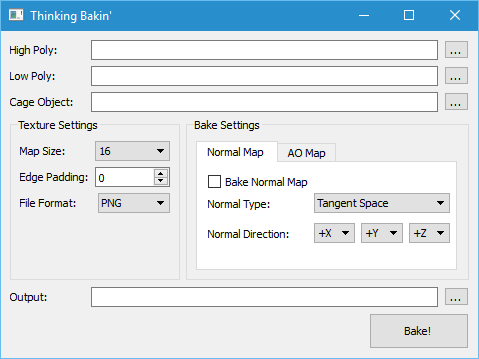 It is now starting to grow into a texture baking management utility that allows a user to define a baking setup for whatever baking engine they want, for whatever map type they want, and batch bake as many textures as they need! Thinking Bakin' doesn't do any baking itself, rather it used whatever baker a user has installed. Click on the link to the right to download the alpha preview. Bakes using the Cycles GPU rendering engine in Blender. Automatically enables Cycles GPU rendering. Blender must be installed to use Thinking Bakin'! Select a cage model to use to project from a high-poly model to a low-poly model. Supports baking Normal(both tangent and object-space) and Ambient Occlusion maps.